Susan Tiner explores her style in her personal style blog, Style Made By Hand. I'd like to introduce you to one of my November sponsors. 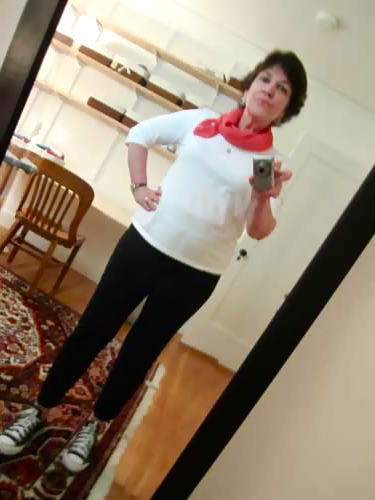 Meet Susan, who blogs her personal style blog, Style Made By Hand. You'll find her on my +40 Blogroll, and most likely have seen her comments on many of your favorite blogs. She's a fellow Californian, and is currently exploring her style through various sewing projects and sharing her experiences with her readers. 1) What's your name and what do you do? How would you describe yourself to a stranger? 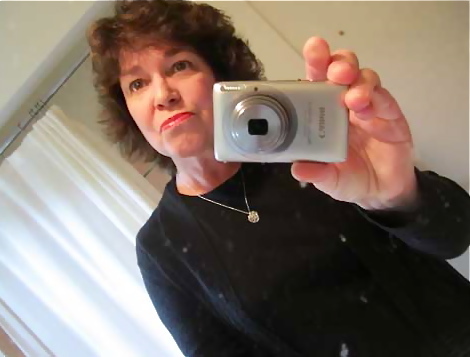 My name is Susan Tiner, and I'm a retired software engineer with a very part-time financial consulting business. As for what I'd say to a stranger, I might say that I sing in an Episcopal choir with my fiance Martin, voraciously read history, sew, blog, take care of our home (and our two tabby kitties named Brownie and Gray,) and visit with my adult son and daughter and their sweeties whenever possible. 2) Your blog, Style Made By Hand, describes itself as a "minimalist exploring personal style through craft." By craft, I gather you mean sewing. 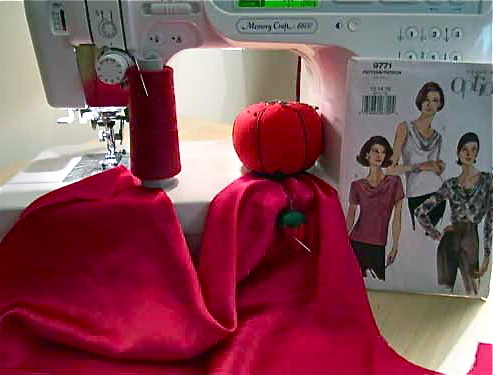 How long have you been sewing, and how does this craft help you explore your personal style? I learned to sew while growing up. Family finances were constrained, limiting opportunities for new clothing purchases. Sewing provided a way to have more outfits. Once I had children, I stopped sewing for myself, and sewed exclusively for them- primarily every day clothing, but also clothes for special occastion, like ballerina and Halloween costumes. I stopped sewing regularly about 20 years ago, then started again this year, as part of my personal style quest. The style quest began as a self knowledge journey- I wanted to understand why I'd given up on fashion, and was dressing like an impoverished grad student. Early on I learned that I do love clothes, but I'm frustrated with the ready-to-wear options, which often don't fit well and almost never express my style. 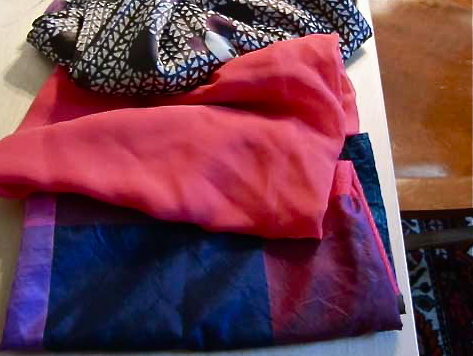 Sewing lets me pick the pattern designs I want to work with, modify them to fit, select fabric that suits my preference for quality and design, and it's fun! 3) Has blogging had any impact on your personal life? If yes, how so? Most definitely. I've met so many wonderful people online, and have learned a lot from them. In writing the memoir posts on my old blog (financialorganizing.info,) I was able to write the past into perspective, and let previously painful memories stay at rest, to be at peace. As for the new blog, I don't think it would have been possible to find my style in such a short time if I hadn't had so much exposure to other bloggers writing about fashion and style. Seeing what other real women do, helps me classify information a lot more efficiently than I could roaming through stores or reading fashion magazines. I hate shopping. And fashion magazines seem like nothing but ads with gorgeous photography. 4) Name some of your favorite blogs/must reads. I don't like to pick favorites because different bloggers inspire me at different times, but these days I'm really inspired by Style Crone for moving thoughts on integrating style and life processes such as grief, K-Line for superior sewing and knitting skills, and Restingmotion for both the way she writes beautifully about living with style and grace amid the reality of her husband's worsening dementia and for her superior sewing and knitting skills. So many other bloggers inspire me, but right this minute if I had to pick three I would pick these three because they speak most directly to me where I'm at in my own style quest. 5) You've recently became engaged. What advice would you offer any lonely hearts out there, regarding finding true love? Take your time. Anyone who's read the memoir posts on my old blog knows that I've gone through three divorces. Not fun. If I could live my life over again I would wait longer before deciding to make a permanent commitment to someone. It takes years to really get to know another person. Martin and I have been living together seven years, plenty of time to work on our relationship and make sure it is right for each of us. True love allows space and time to let it unfold. Disclosure: Susan is a sponsor for the Citizen Rosebud, and I was given compensation for this post. Love Susan's blog and evolving style. She's as lovely and charming in person too! Always fascinating meeting new people in the bloggosphere. Lovely Susan. Off to her blog. Thanks Bella...I love getting to know Susan better..she often comments on my blog! I am so impressed with the fact that she sews, blogs and runs a business!! I <3 Susan!! It was so great learning about her through this post!! Thanks for sharing Bella. Hello Bella, what a surprise, I just got home from church a little while ago and was thrilled to see you got the interview posted. Thank you so much for featuring me! Such great advice!!! She seems totally inspirational, sweet and down-to-earth. I'd never heard of her before, so thanks for the introduction! Wonderful interview! I adore Susan's posts, it is grand to get to know her a bit better. I love Susan and her posts. What a great interview - now I know even more about her. Sounds like an inspiring lady! Great interview. Off to check her out. Hope u can visit my blog and let me know whether u like to follow each other. going to check her out.